Hi, it’s Tamara, owner of Consign Couture. I took my first trip to Paris when I was 19 with my mom and hated every second of it. I got into a fight with a French sales associate who was mean to my mom and was cat called and followed around the Eiffel Tower incessantly. I had no desire to go back. Ever. Despite all of that, I ultimately fell in love with the energy of the tour guide we met on that trip. His name was Maurice, and he was that most amazing retired art history professor. We met him in Paris and then went on to Belgium with the tour; I was never far from him the entire tour. I loved the passion he had for sharing his knowledge and I never forgot the experience. It was during that time when I started to dream up tours of my own that I could lead in the future revolving around consignment shopping. Fast forward to my next trip to Paris when was I was 26. This time, I fell in love with the city. 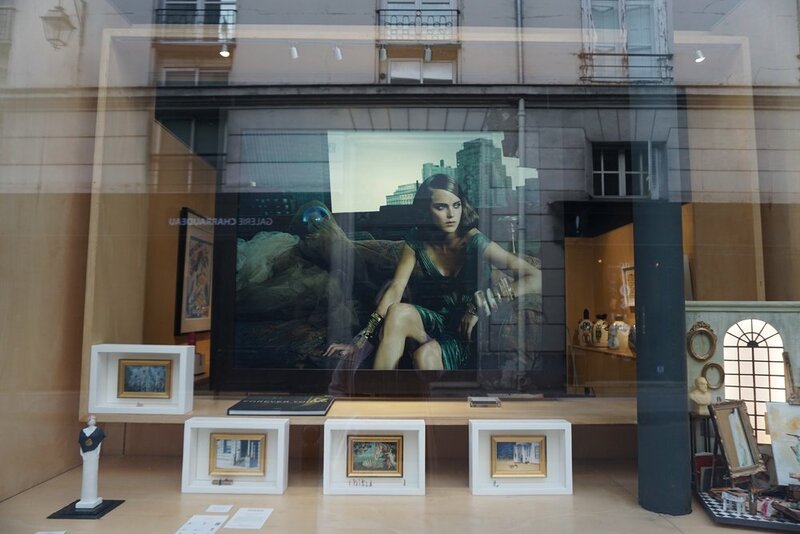 I finally got a glimpse of the “je ne sais quoi” of Paris and my obsession began. The shopping tours I've been putting on the last several years have been a labor of all the things I love. While preparing for an upcoming branding photoshoot, I realized that what brings me the most joy in my business is facilitating and creating experiences for people. I thrive on the energy of curating experiences, and building community based around those experiences. I love connecting people; I have been doing that my entire life. If there's one thing I know about myself for certain it’s that if I decide to do something and put my mind to it, I make it happen. No matter what. Last year I started dreaming big. 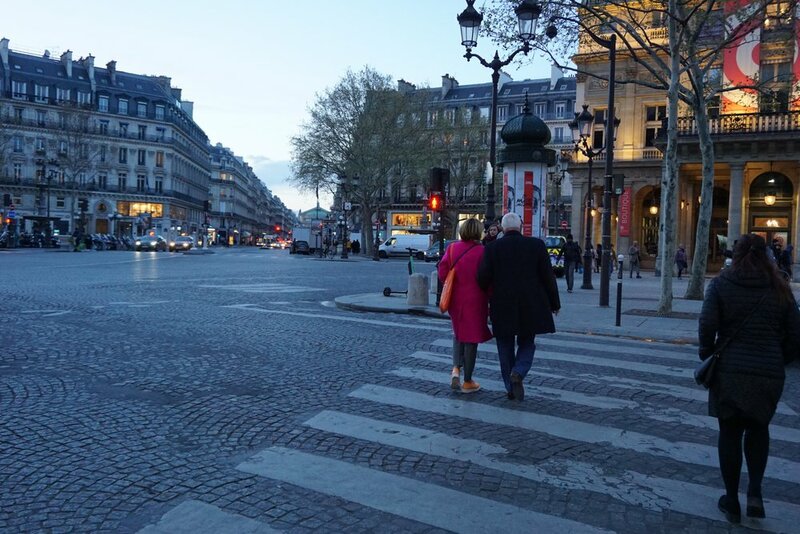 I decided to combine my love of guided tours with my love of Paris: I worked on my strengthening my connections there and began networking with other travel guides who focus on female group tours, thus beginning my research for my first Parisian shopping tour in 2020. Shout out to Mary at Living Big Travel for lending me her years of knowledge and experience from the tours she’s been leading. She is also a travel planner and concierge. I cannot stress enough that if you are not an expert traveler, her guidance, preparation, and assistance when traveling can greatly enhance your experience. One thing she told me right from the start is to not book airfare for anyone on the tour because there are too many variables that can go wrong when doing so. 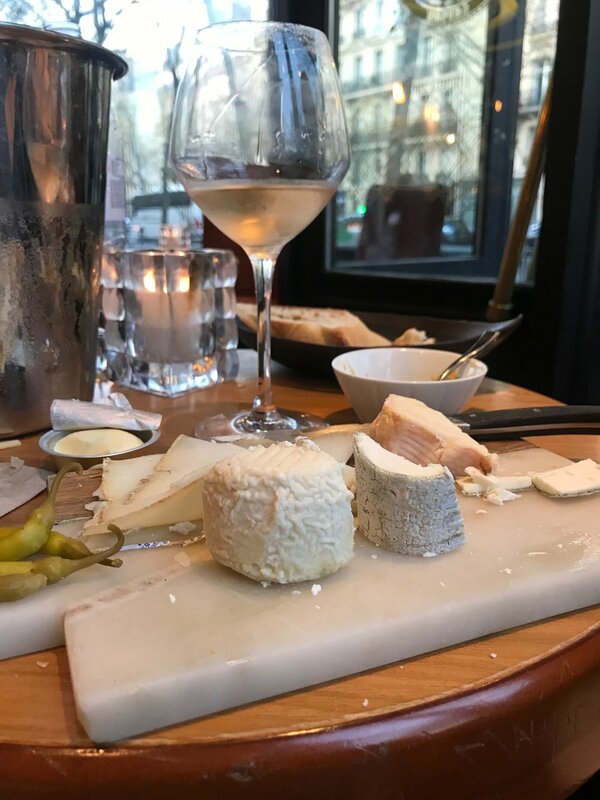 I was so relieved to know that I’d just be planning the food, lodging, and experiences: and that’s exactly what I’ve been doing as I compile and curate my lists of Paris favorites that I’ve found over the years. 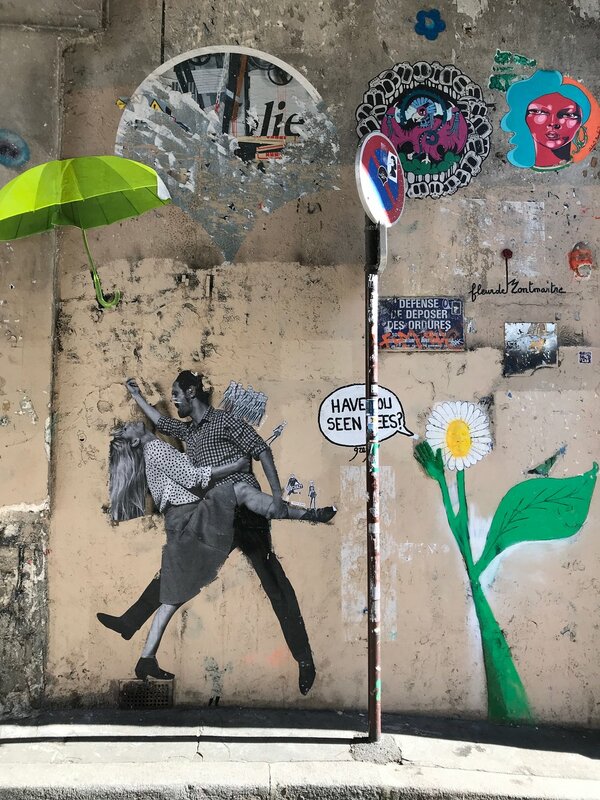 As I plan my shopping tours for Paris next year I would like to share some my notes this far that you may find helpful if you have an upcoming trip to Paris. Or maybe this will inspire you to take one even if you didn’t already have one planned! I highly recommend taking an entire day off before and after you do any international travel. Those extra days give you space to prepare and recover before and after your journey. Traveling via commercial airlines is stressful on the body, so having a day to rest and make sure you’re fully prepared is very helpful. In addition, taking the day off after you return home gives you time to readjust to the time difference and begin to recover from jet lag. I always get sick when I come home from International travel. Highly recommend taking wipes to clean your tray table/etc. To begin the process of packing, lay out all the clothes you want to take on your bed. Then, remove at least half of those items. I know his sounds crazy, and it will be difficult, but just remember that part of the fun of traveling is acquiring a few new things, so you’ll need to leave room in your suitcase. I recommend taking a few outfits you can wear over and over, and only taking one versatile jacket. The jacket is the most important thing when going to Paris - it can make any outfit better if you choose well. My recommendation is long, loose, and trench-style. I swear - the less you bring, the better. Having to check a bag when traveling internationally can be a big pain, especially if you have to transfer during a layover. In this case, I suggest a carry-on sized suitcase, a backpack, and a small crossbody bag that can fit in your backpack. A phone pouch you can wear around your neck can be helpful so you have easy access to your phone and money. My personal favorite phone/money pouches are by Bandolier. Fanny packs and belt bags are also a great alternative to a crossbody if that’s not your thing. TAH make some truly adorable ones. 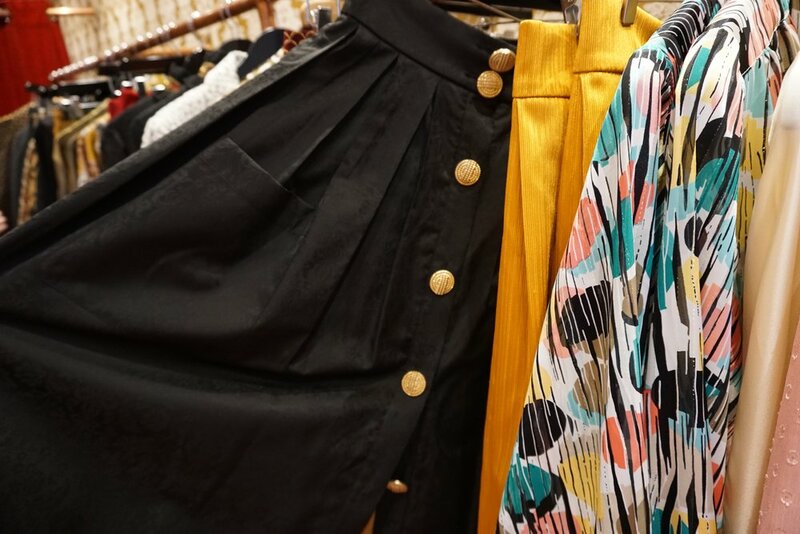 If you’re planning to shop in Paris, I recommend bringing some older clothing you’re willing to part with on your trip. You can wear them at the beginning of your trip, then recycle them further along to make space for the new garments you purchase. Sézane is a wonderful shop where you can recycle your clothing (I’ll talk more about this shop later.) I am a big fan of light packing for trips: every time I have brought more than one pair of shoes or more than one jacket on a trip I have regretted it. Being as comfortable on the plane as possible is the goal. I suggest wearing leggings/comfortable travel pants, a t-shirt, and sweater (cashmere blend is best for warmth/comfort), a hat/beanie, compression socks, and a pair of comfortable sneakers. If you didn’t know, Paris is divided into 20 arrondissements. I have stayed in almost every neighborhood. My favorites are the 6th St. Germain and the 18th Montmartre. 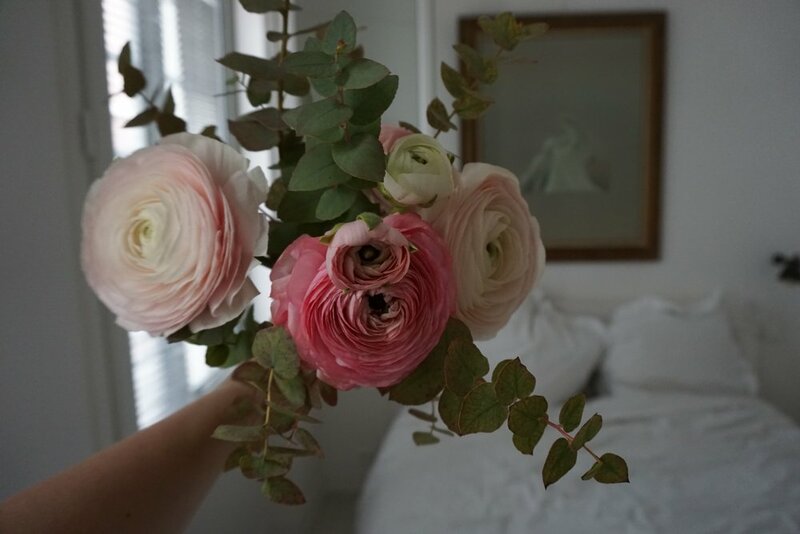 No matter where you stay, I highly recommend getting some fresh flowers for your apartment or hotel room. It immediately brightens things up and makes your temporary home feel fresh and welcoming. I met this designer on this trip and she’s amazing. I recommend walking, using the metro system, and if the situation calls for it, Uber. Paris traffic is horrendous, and it can often take just as long to walk somewhere as it does to drive there. I highly suggest familiarizing yourself with the Paris metro system. The Paris Metro app is perfect for this: you’ll thank yourself later if you get used to the app before you need to use it. 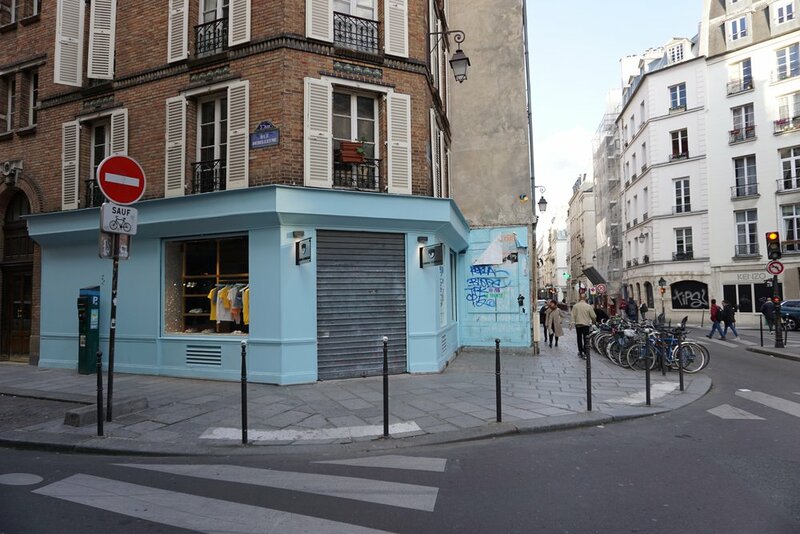 Many of my favorites shops in Paris are concept stores that house multiple businesses in one. When this is done right, it’s so lovely. A concept sore is a curated space that brings together carefully selected products and lines that create an overall experience for the customer. Ultimately, every piece in the store should connect to a theme or evoke a specific lifestyle. Concept stores often include restaurants, cafes, event or gallery spaces, etc. to add to the overall experience. You could seriously spend all day shopping here. Plus, Merci has three incredible restaurants! A concept shop that sells clothing, swimwear, accessories, and more. Christy Paris sells wonderfully crafted accessories and jewelry. A Parisian designer who creates incredible garments in her Paris atelier. Her aesthetic is luxurious, yet her price range is still relatively affordable. A curated boutique that features many independent designers and clothing for women and men. Not only can you recycle clothing at this concept shop, you can also write postcards for free and take pictures in their photo booth. Plus, you can shop for well-made garments and accessories at reasonable prices. 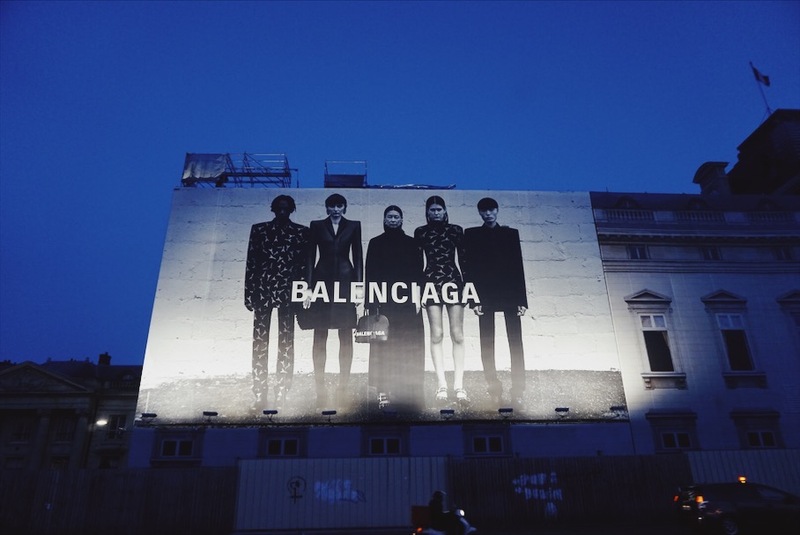 With seven locations around Paris, you’re sure to find some great pieces. They specialize in vintage clothing and accessories with a focus on ethical fashion. Yes, I know this one stands out on this list, but it’s a really fun stop to make. Not only do they provide complimentary champagne, you can also snag LV bags at lower prices since the brand is based in Paris. 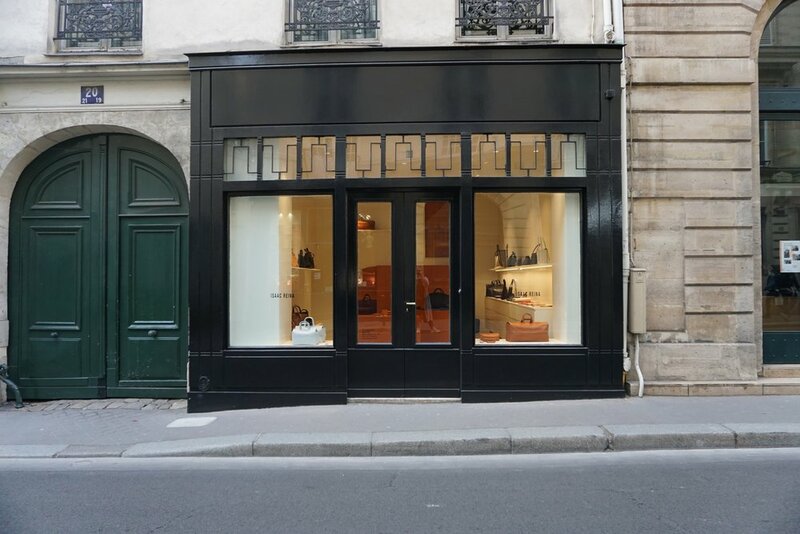 The flagship location is on Champs-Elysees, but my favorite location is in the Saint Germain neighborhood. This store can be hit or miss, but it’s worth a shot. Sometimes you can find some great deals. 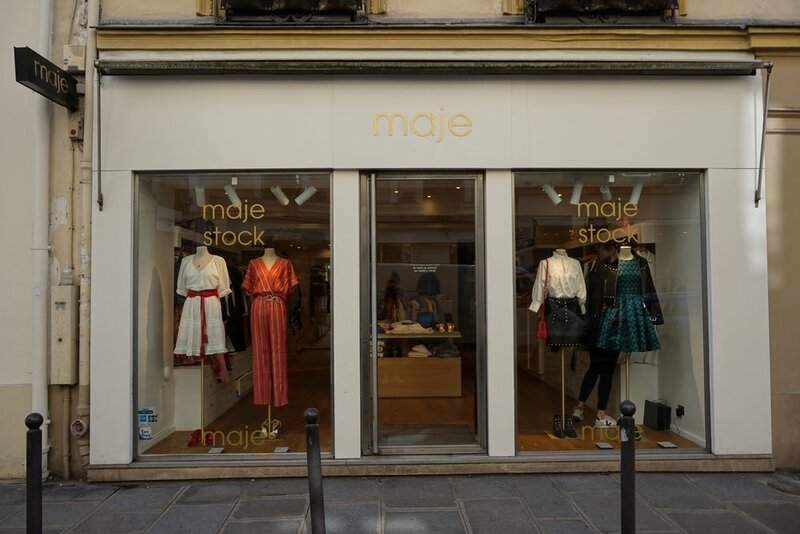 Maje stores you will find all over Paris and their styles are well made & such a score if you find secondhand in the US. Seafood restaurant at 20 Rue Singer, place Chopin. Take a cruise down the Seine at night and watch the city light up. 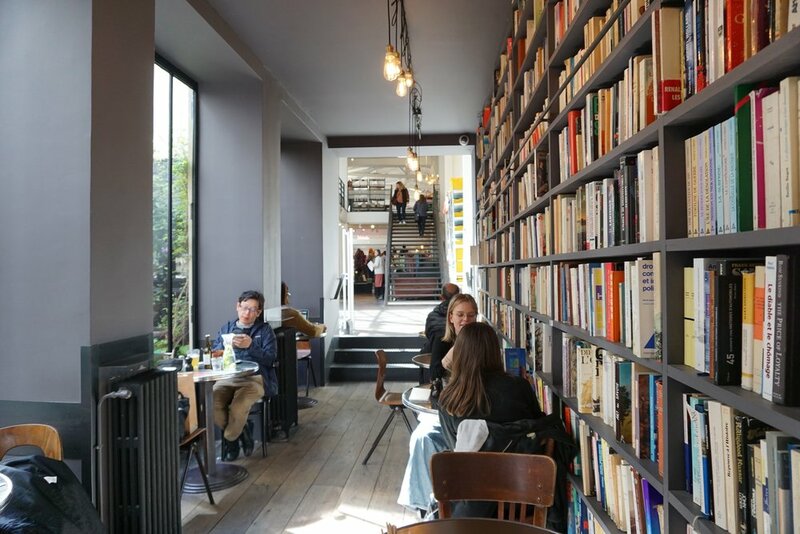 Spend a night eating crepes, drinking cider, and listening to jazz in the Montparnasse area. Join a dinner party via EatWith. The Musee d’Orsay is a must-see. 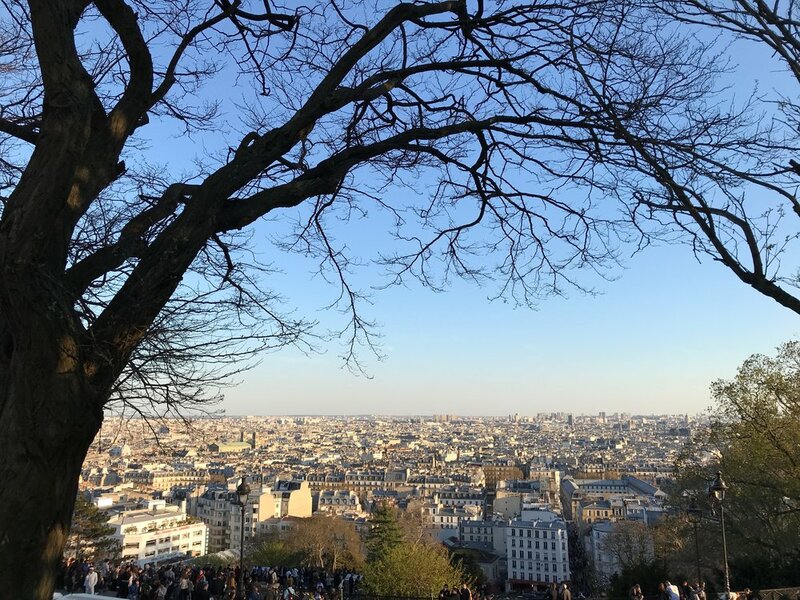 Explore Montmartre - walk around the back side of the Sacre Coeur for quiet and no crowds (a great place to picnic), eat at Jeanne B and Soul Kitchen, and consider catching a show at Au Lapin Agile. Check to see if there are any events or readings at Shakespeare + Co.
Go out to Versailles, but ask around/search online/go with a guide to hit the water fountain displays. I also recommend visiting a Hammam style spa such as O’Kari. It is an incredible experience. 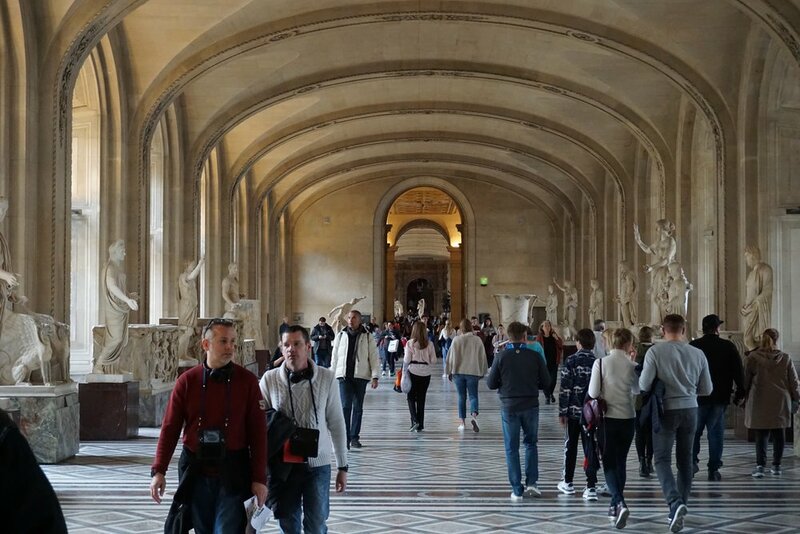 If you are interested in visiting the Louvre or Musée d’Orsay, consider hiring the painter Kate Chartire as a personal guide; she has studied art in Paris for a lifetime and her tour prices are very reasonable. You can reach out to her at katerivoli@yahoo.com. Something good about France is that they don’t have nearly as many “new” things as we do in the United States. Things there are made to last and are used for a long time- usually until they literally can’t be used any more. Things there are old in the best way; things and places have such rich histories and stories to tell. In addition, the food in France is to die for. There are so many options and wonderful restaurants to explore. That being said, there are many things to be aware of while you travel. For one, there is a ton of tourist trap type food. To truly have a great foodie experience, you need to do some research first, or you may end up with a subpar dining experience. I suggest checking out TripAdvisor the night before you head out to eat to figure out some options beforehand. Unfortunately, you need to be wary of theft, especially in tourist-heavy places. I personally don't suggest visiting the Eiffel Tower other than viewing on a walk at night from afar or from a car driving by. During the day the scene there is very touristy and there are tons of pick pockets who will try to take advantage of you. Same goes for places like the Louvre. Be careful in these spots if they are on your destination list. Stay vigilant, and be suspicious of nice looking people needing help, people pushing empty baby strollers, etc. This article details some of the things you need to be aware of in order to avoid being pick pocketed. My round up of Parisian vintage, secondhand and the flea markets will be in a future blog post. 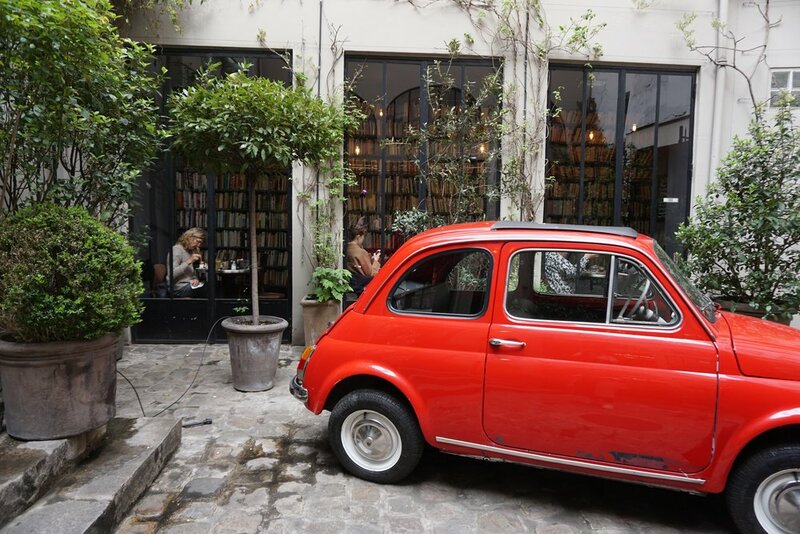 A wonderful cafe in the 6th Saint Germain neighborhood. On the Women of Paris walking tour. There are great vegan / vegetarian places in Paris. You have to search them out and, of course, get whoever is traveling with you to agree. 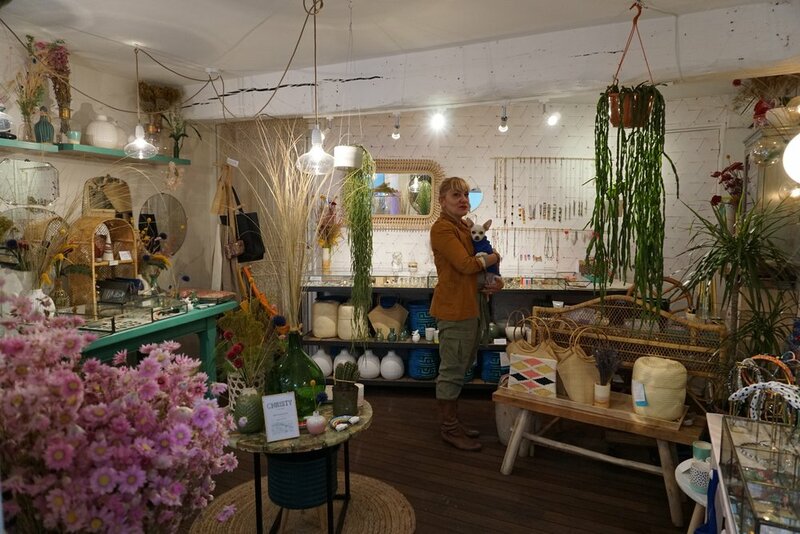 Fell in love with one of the designers / co-owners of this concept store Belles Amies. This is Brad Pitt, the dog of the designer of Christy’s jewelry. French linen stores are wonderful. I always come back with a new tablecloth & tea towel. 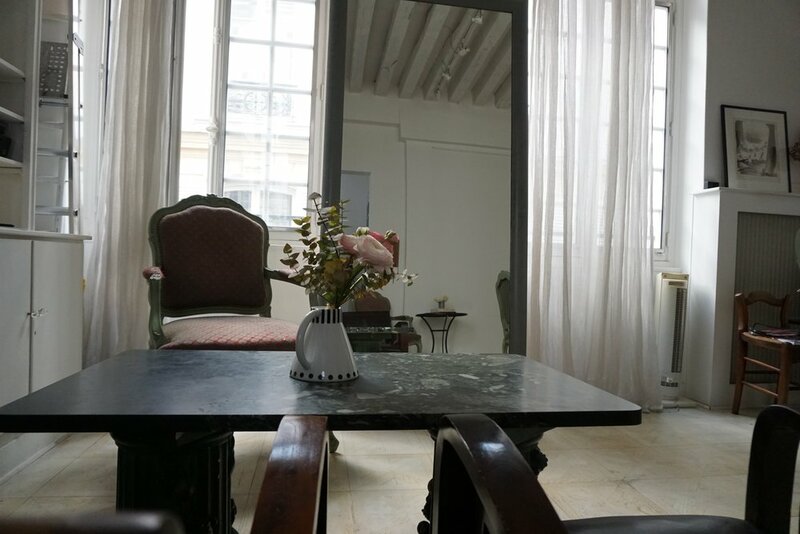 The apartment I stayed in is for sale for 995k euros! Before it sells you can rent it on Airbnb here. Walking in to the store Marilyn Feltz is a must if you enjoy fashion. I tested many and have determined that my favorite croissant in Paris is from the bakery Poilane. This place is a must stop. Inside Christy Paris. Amazing original jewelry designs. My set up to plan a day of meeting boutique owners and exploring. You can walk right into the Louis Vuitton HQ which is quite a space. As I mentioned in my write up the flagship Louis Vuitton is a fun stop. The sunset at the Sacré-Cœur is the best - on the other side of it.